February 1, 2018 1:23 pm. DB Pin drives to the lead in the G1 Centenary Sprint Cup ahead of Mr Stunning and Beat The Clock. One of the top sprinters in Hong Kong, DB Pin has his connections Dubai dreaming after an excellent neck victory in the Group 1 Centenary Sprint Cup on January 28 over Sha Tin’s turf course. Leading home a 1-2-3 sweep for top Hong Kong conditioner John Size, the New Zealand-bred grandson of Danehill overtook highly rated Group 1 Hong Kong Sprint winner Mr. Stunning with a determined drive, hinting that he is still amid a positive form trajectory. DB Pin, who has raced on grass in all but one start, a dirt victory in a Sha Tin Class 2 handicap last April, will now switch surfaces and possibly point for the Dubai Golden Shaheen at Meydan on March 31st, Dubai World Cup day. Last year, Size-trained Amazing Kids was sixth in the Group 1 Al Quoz Sprint. 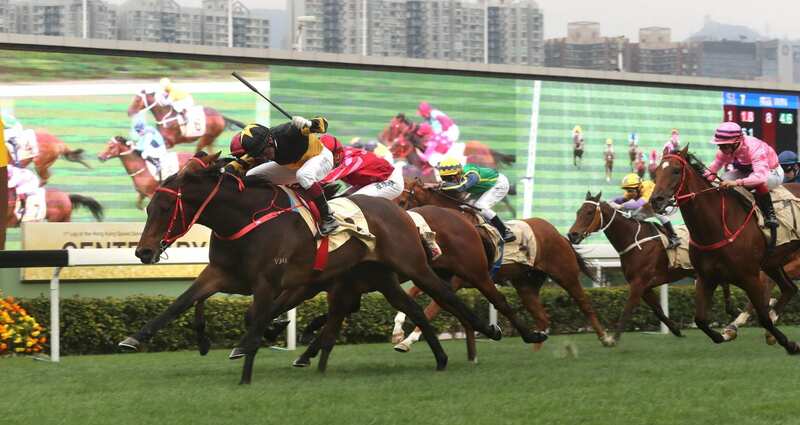 In other Hong Kong-Dubai news, according to the Hong Kong Jockey Club, Sha Tin Class 2 handicap winner Classic Emperor will opt for a February 22nd 1600m handicap at Meydan as his local debut in lieu of the Firebreak (G3) five days prior at the same trip. Popular Group 1 winning jockey Derek Leung will ride the son of Medaglia d’Oro, who is expected to arrive in Dubai the evening of February 8th.